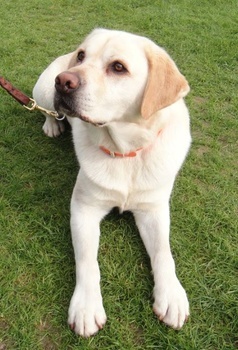 Paw Print Genetics - I've heard about cystinuria in Labradors. Should I be concerned? One such test that has recently been added to our expansive menu of test offerings is for a condition in Labrador retrievers known as cystinuria. Cystinuria in the Labrador is a condition caused by a mutation of the SLC3A1 gene. This gene functions as a blueprint for a protein that allows the kidneys to transport cysteine and other amino acids from the urine back into the body. Normally, cystine is reabsorbed in the kidneys and only small amounts are eliminated in the urine. However, in cystinuria, cysteine cannot be reabsorbed and excessive amounts of cystine are excreted in the urine leading to formation of cystine crystals and/or stones in the urinary tract. In affected dogs, stones frequently form in the bladder leading to inflammation of the bladder wall and symptoms resembling those of a urinary tract infection (straining to urinate and frequent urination of small volumes). The most serious situation is when stones cause blockages in either, one of the two tubes connecting the kidneys to the bladder (ureters) or in the tube from the bladder that leads out of the body (urethra). Blockage of a ureter leads to back up of urine eventually causing severe damage to the kidney (and kidney failure) on that side of the body. Though this situation would be painful and should be treated immediately with surgery, the healthy kidney typically compensates for the diseased one, often preventing obvious signs of urinary tract disease. Blockage of the urethra on the other hand results in obvious signs due to an inability of the affected dog to urinate. Any complete urinary blockage of the urethra is considered an emergency. In normal dogs, urine is an important route of elimination for the mineral potassium. In dogs with urethral blockage, the potassium level of the blood increases rapidly and can cause cardiac arrest within a few days. Though affected males and females tend to excrete a similar amount of cystine in the urine, blockage of the urethra is far more common in male dogs than in females due to the narrower and longer urethra present in males. On a side note, not every dog with cystinuria forms stones despite having elevated cystine levels in the urine. It is currently unknown why some affected dogs form stones and others don’t, but it is likely related to the effects of other genes inherited by the individual or to environmental differences such as water consumption volumes. Surgical intervention is the typical treatment option for any situation in which a stone is obstructing the urethra or ureter. In situations where the stones are only present in the bladder, an attempt can be made to dissolve the stones using certain medications in combination with a diet to help prevent further stone formation. However, some of these particular medications are difficult to obtain and expensive. In addition, the medications that are easier to obtain tend to have a significant side effect profile that often prevents completing treatment in some dogs. If the stones cannot be dissolved for some reason, surgery is the only option to remove them. Unfortunately, affected dogs will often reform stones after surgery, especially if not kept on a special prescription diet formulated to keep urinary excretion of cystine to a minimum. Given the difficulties in treatment and prevention of stone formation, the best way to prevent issues related to cystinuria is to prevent puppies from ever being born with the mutation that causes it. This can be achieved through genetic testing of the dam and sire prior to breeding and avoiding the breeding of two dogs that are both carriers. Cystinuria in the Labrador is inherited in an autosomal recessive manner meaning that a puppy must inherit two copies of the disease gene (one copy from each parent) in order to develop the disease. Affected dogs with two copies of the mutation should not be bred and should be removed from the breeding pool. However, carrier dogs can be bred with dogs that are known to be free of the mutation, resulting in 50% carrier offspring and 50% normal offspring. No dogs born to one normal and one carrier parent would be affected with cystinuria. Cystinuria also occurs in breeds of dogs other than the Labrador retriever, though the genetic mutation responsible for the disease is different. Paw Print Genetics currently offers tests for cystinuria in the Australian cattle dog, Australian stumpy tail cattle dog, Newfoundland, and Landseer Newfoundland. Paw Print Genetics also offers genetic testing for a condition called hyperuricosuria that is associated with formation of a different urinary stone type, called a urate stone. Hyperuricosuria is known to be inherited in over a dozen breeds, including Labradors.